WhatsApp Business has been launched. What are the advantages for small businesses? Facebook launched a new version of Whatsapp dedicated to small businesses. The free app WhatsApp Business, now available to download on Android, is aimed at businesses interested in creating, improving and maintaining a professional bond with their customers. Whatsapp Business allows professional communication between clients and businesses, which can register to the app with their business or personal phone number. The launch of the app was already announced in September 2017. At the moment, WhatsApp Business is available in several countries, including Indonesia, Italy and UK. Facebook didn’t state whether the application will be also available for IOS.Another version will be soon created for larger businesses. Through the creation of a Business Profile, main info such as address, email and other contact details are available for customers looking at your activity. Businesses owners can reply to queries, set automated messages as well as quick answers and greeting texts. In addition, the app provides businesses with the opportunity to check their communication trend. For instance, they can have access to the number of queries they answered and the number of people who contacted them. How can businesses benefit from the use of the app? There are many advantages of using Whatsapp Business. Today many business owners use private channels such as their mobile phone, to communicate with their clients instead than professional ones. This is not a habit showing professionalism. On the contrary, by using the new app businesses can show their efficiency. Moreover, by creating a Business Profile they will give visibility to their business. Customers will be able to view restaurants address and contact details. This is something important today, with people using technology to find, discover and review businesses. 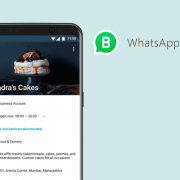 Downloading Whatsapp Business will be also a way to show the interest in customers as well as the fact that businesses keep up with the times and provide clients with an extra service to improve customer service. Another advantage is that businesses can save messages from former conversations and forward them as answers. They can also create automated messages, such as greetings or away texts. Lastly, Whatsapp Web is also useful to monitor the communication with customers. Indeed, through the app, it is possible to discover how many people contacted you and how many messages you sent. This can be an important tool both for new and old businesses to track people’s interest, improvements and weaknesses. https://www.dogadv.uk/wp-content/uploads/2018/01/2018-01-24.png 400 800 design https://www.dogadv.uk/wp-content/uploads/2014/10/doglogo250x67.png design2018-01-24 16:00:562018-01-24 18:10:56WhatsApp Business has been launched. What are the advantages for small businesses?